Sept. 7, 2007, was the day that changed everything for Army veteran Mark Little. Mr. Little—now a graduate student at the George Washington University—was deployed to Iraq just months earlier as a lieutenant in the 3rd Infantry Division in charge of a platoon of around 65 soldiers. An IED blast to his Humvee in Baghdad left Mr. Little with a brain injury in August. Then, on Sept. 7, a single explosion to his vehicle blew off both of his legs below the knee. In a split second, Mr. Little’s military career came to a halting end, and he became a double amputee. Mr. Little could have let the traumatic event define him, but instead he was empowered to help others in similar situations. He decided to co-found Warrior 360—a nonprofit organization that supports the needs of wounded veterans, service members and their families. Now a full-time student in the forensic psychology program at GW, Mr. Little dedicates the rest of his time to helping veterans through Warrior 360 by offering financial assistance, hosting events and connecting them to jobs. Never did he expect that his selfless efforts and positive outlook would one day be repaid with a grand gesture of gratitude from his friends, family and neighbors—with a little help from Ellen DeGeneres and the Home & Garden Television (HGTV) network. Mr. Little and his wife, Alicia, were flown to Los Angeles for a taping of the Ellen DeGeneres Show under false pretenses a few months ago. Once on set, Ellen pulled the Littles on stage and surprised them with some news: they had been nominated by friends to receive a home renovation from the HGTV show, “Cousins Undercover,” hosted by real-life cousins Anthony Carrino and John Colaneri. School of Media and Public Affairs Alumna Victoria Reiss, B.A. '10, is a producer for the show. When the Littles returned to Virginia, they were put up in a hotel for five days while friends, family members and volunteers worked tirelessly to transform their Fairfax house into a dream home. When the couple finally rolled up in a van in front of their home, they were greeted by more than 300 local volunteers cheering and waving American flags—including cheerleaders and ROTC students from George Mason University, where Mr. Little earned his undergraduate degree. 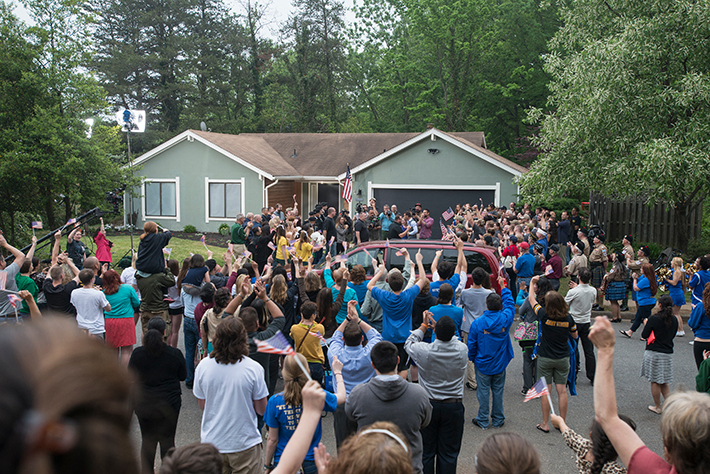 More than 300 volunteers, friends and neighors waited to greet Mark and Alicia Little outside their Fairfax home for the big reveal. Also there to surprise Mr. Little were two members of the 3rd Infantry Division who pulled Mr. Little from the Humvee after the IED blast. He had not seen them in five years. Mr. Carrino and Mr. Colaneri led the couple into their newly renovated living room, and Mr. Little’s jaw dropped. “Wow…wow…this is unbelievable,” were the only words he could muster. In addition to a new floor plan, new floors and new furniture, the cousins made sure to include personal touches in the room. 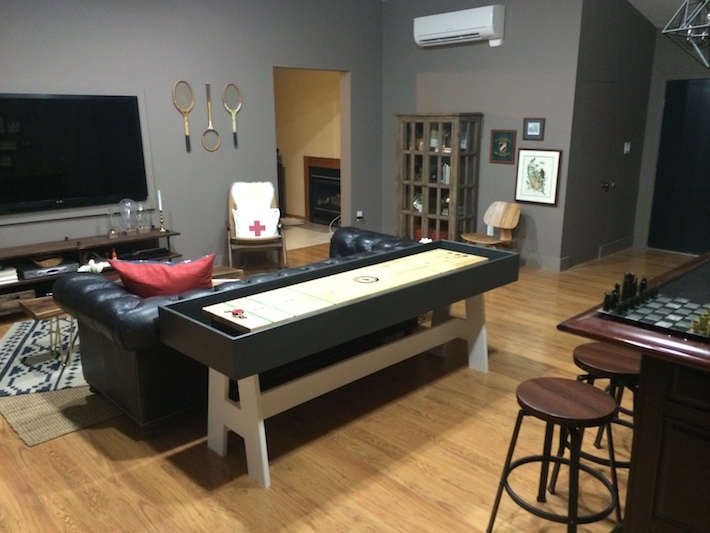 They built Mr. Little a customized shuffleboard, complete with the Warrior 360 logo. On the living room wall they put Mr. Little’s more than 400 military “challenge coins” on display in glass frames. These coins are presented to service members in recognition of special achievements. The cousins also installed new air conditioners throughout the house, so Mr. Little would no longer overheat inside—a common problem for amputees. The Littles then made their way to their new bedroom. They were pleased to see newly built closets in the bedroom, which had not been there before, and a refrigerator built into the nightstand, so Mr. Little would not need to leave his room to get a drink of water in the evening. “We don’t have to walk across the house to change anymore. Our clothes can actually be in our bedroom where most people would like it,” Mr. Little joked. But the most exciting part of the home reveal was the guest bedroom—which had been transformed into an indoor spa with a hot tub, a perfect luxury for Mr. Little to come home to when his limbs are sore after Warrior 360 events. The Ellen episodes Mr. and Ms. Little were featured on aired in May, while the hour-long “Cousins Undercover” episode will be shown on HGTV sometime this summer. For Mr. Carrino and Mr. Colaneri, having the opportunity to renovate the Littles’ home was especially fulfilling. “Mark’s story is incredible. Anyone who can get blown up and talk about nothing but positive things and instilling that positivity in others and helping others with the same problems, is really beyond words,” Mr. Carrino said. But Mr. and Ms. Little say they owe their gratitude to the Ellen Show, HGTV, and most of all, to the friends and family that helped pull off the home makeover.